We have lived in Bali on-and-off for five months. It has allowed us to soak in the amazing culture, great food, and all the incredible sights. Of the many places to visit in Bali, at least ONE waterfall has to make it on the list. 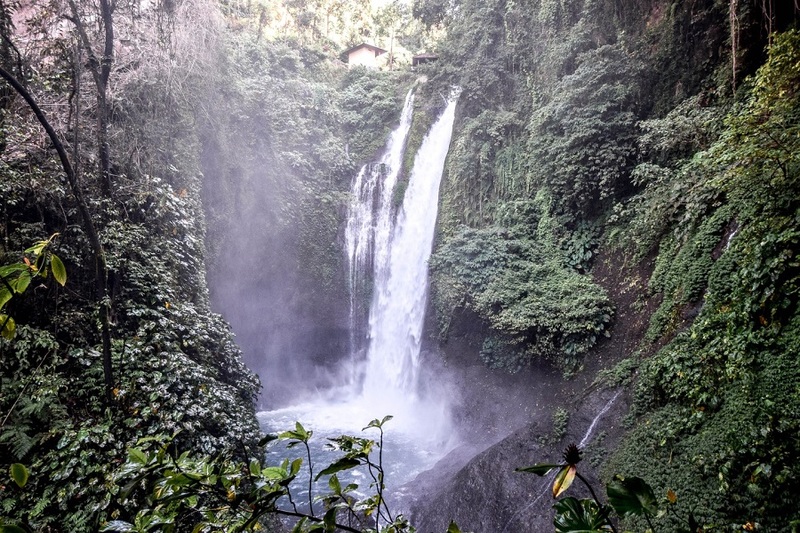 If waterfalls are your thing, then you are in for a treat, because Bali has some really good ones! 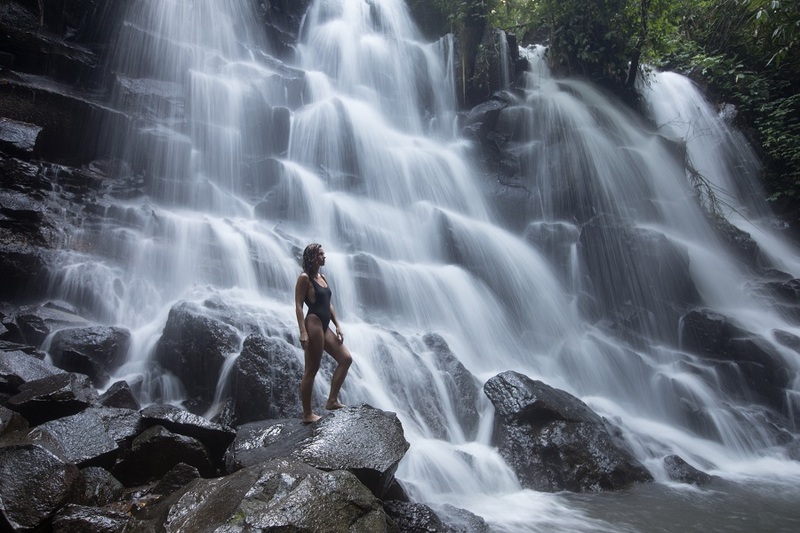 After exploring the waterfalls in central and north Bali, we ranked our favorites. 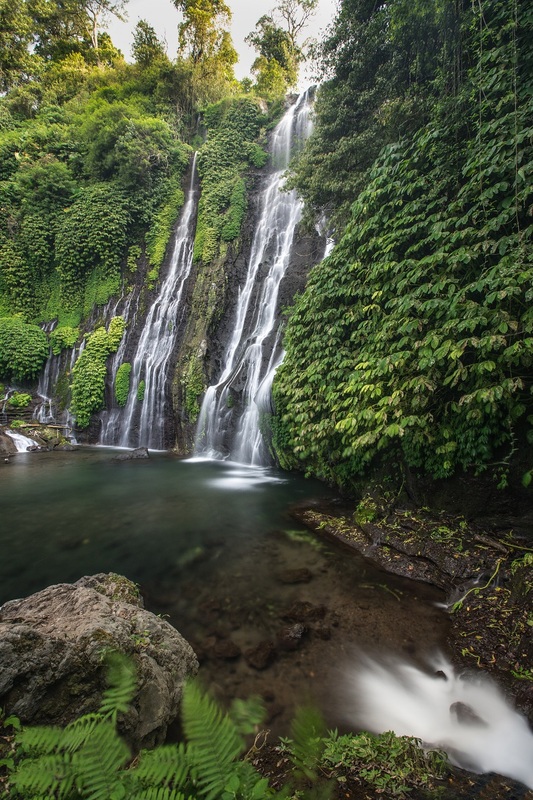 These are the 10 best waterfalls in Bali. 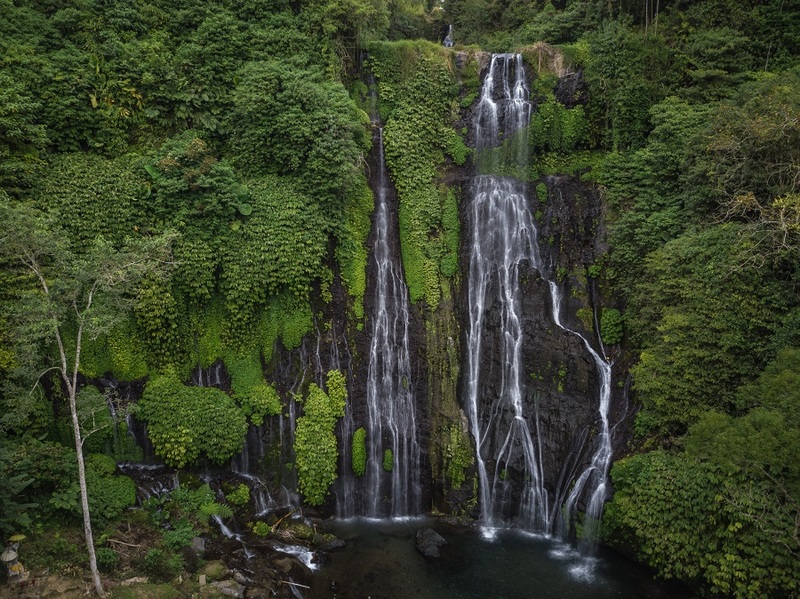 Tibumana Waterfall is a small, but picturesque waterfall and cracked into the list because of its accessibility from Ubud. 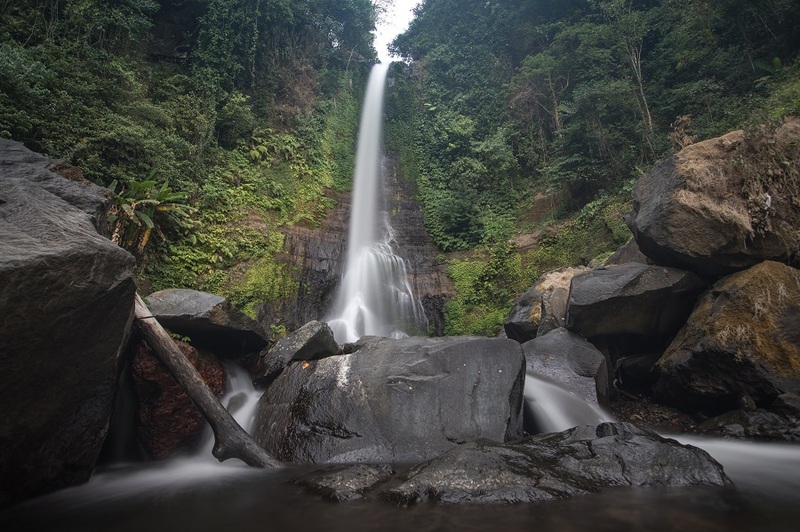 It is a popular day trip including other nearby waterfalls; Kanto Lampo, Tegenungan, and Tukad Cepung. Located 40 minutes east of Ubud. This waterfall has an incredible amount of green foliage and moss all around the base of the falls. When there is no direct sunlight on the waterfall, it sure is pretty. 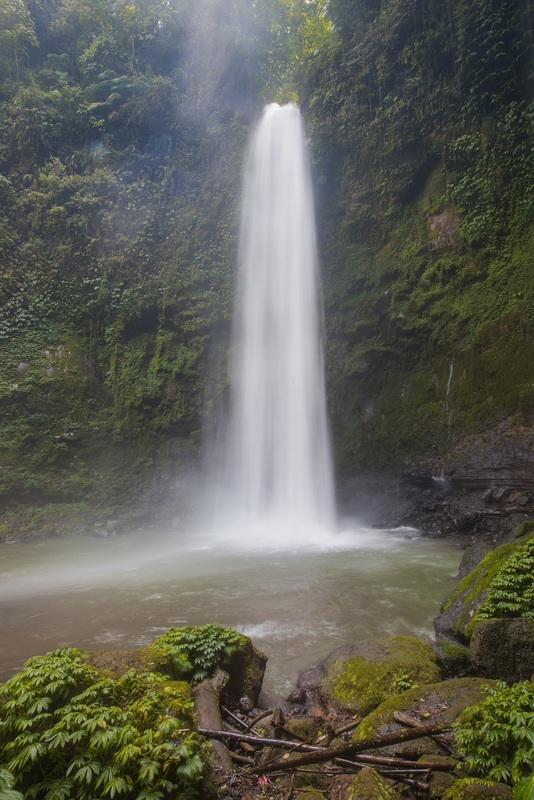 Munduk falls is a good waterfall to visit with nearby Banyumala Twin Falls and the temples around Bedugal. Located in north Bali near the village of Munduk and Lake Tamblingan, it is one and half hours from Ubud. So much green around Munduk Falls! There is no spot for swimming, but worth the quick stop the see this beauty! 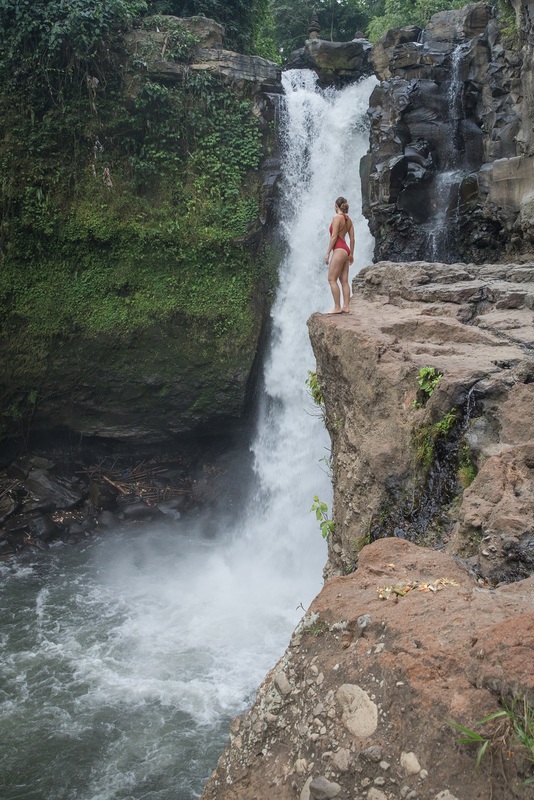 For all adventure junkies out there, Aling Aling is the best waterfall stop in Bali for cliff jumping. However, it comes with the highest cost. 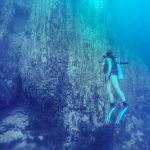 A guide is required to make sure you are safe while checking out the natural water slide or jumping from a 5-meter and 15-meter cliff. 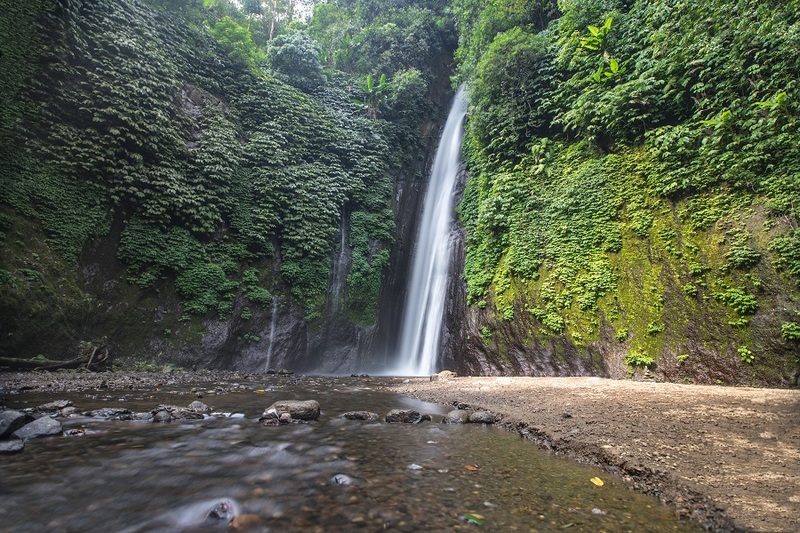 Aling Aling is the main waterfall, but there are three other falls included in the price which have different cliff-jumping opportunities. 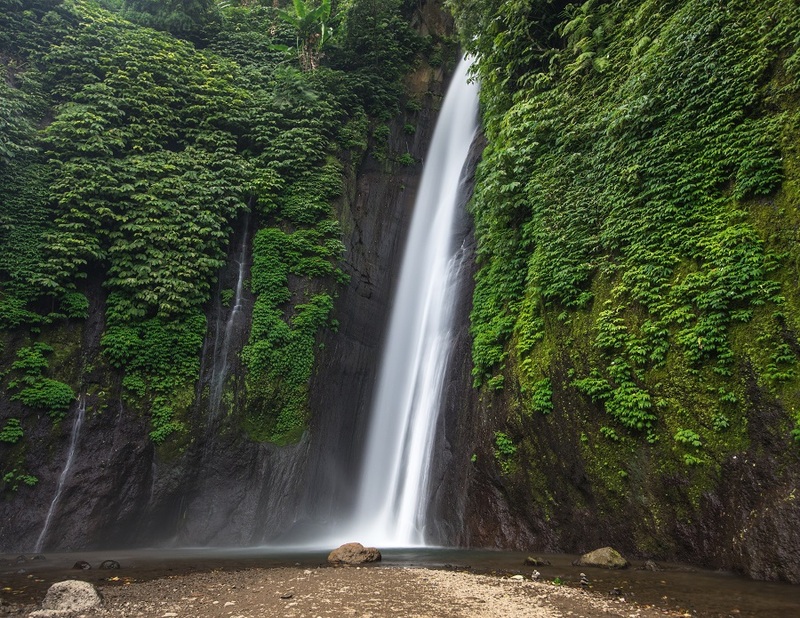 This waterfall is action-packed and is the most fun in Bali. Located in north Bali not far from Lovina, it is a 2-hour drive from Ubud. Entry Cost: For just viewing the waterfall without a guide (no swimming) it is 10K Rupiah entry. If you want to swim or cliff jump it is 125K Rupiah which includes a guide. Parking is 2K Rupiah. Nungnung is a popular waterfall up north that is often part of a waterfall tour. 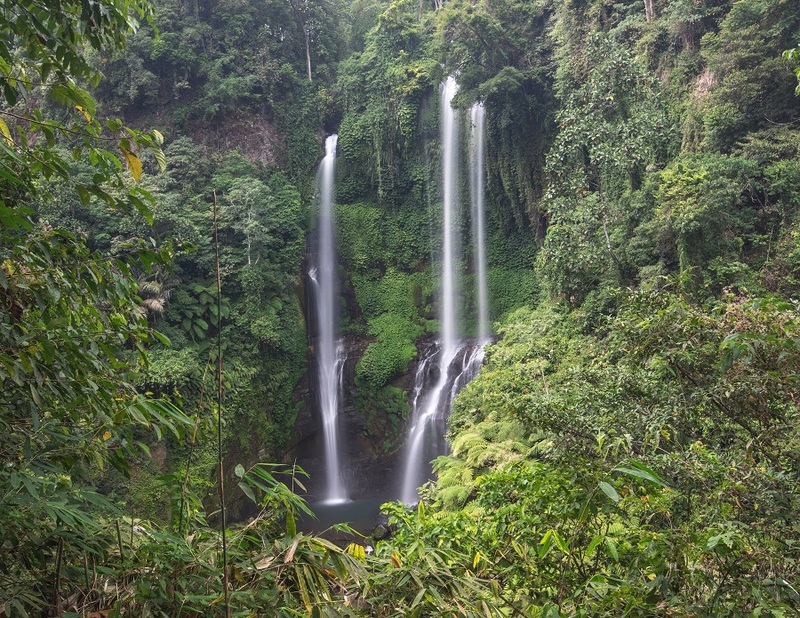 There is not much around Nungnung, but this is a good first stop from Ubud to other waterfalls in the north. This is a very powerful waterfall, so there is a lot of mist going to the right side of the waterfall. This makes the left side the best place to relax and leave your belongings. Because of its popularity, it is best to get here as early as possible. Located between Ubud and Bedugal in central Bali, it is a one hour drive from Ubud. Getting pictures from this side of Nungnung was tough with all the mist! There are a few waterfalls called Gitgit as I was driving up north, this is the “official” Gitgit Waterfall. 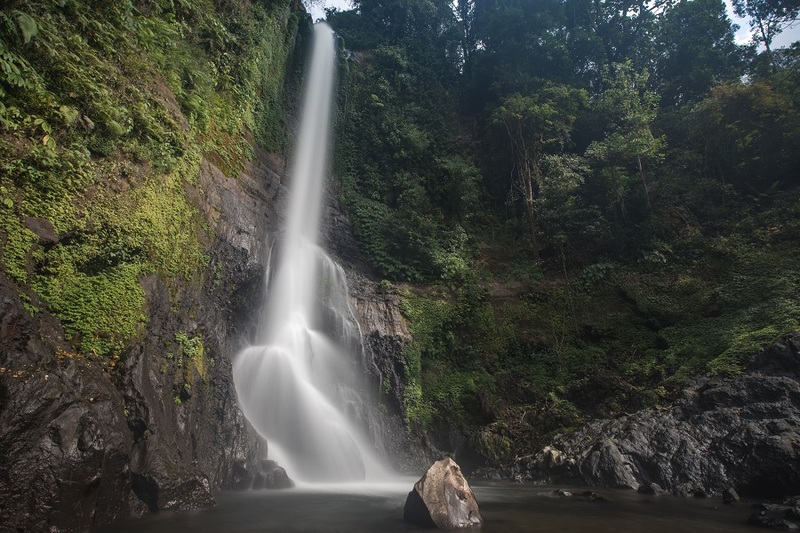 The other popular one is called Air Terjun Campuhan, also known as Gitgit Twin Falls. There is a large parking area, where you have to cross the street to the footpath. Gitgit is a single drop waterfall. The river is not too deep, so you can get creative with different spots in the flowing water. My favorite shot though was from up on the trail to the right side. Located in north Bali, Gitgit is a little under 2 hours from Ubud. 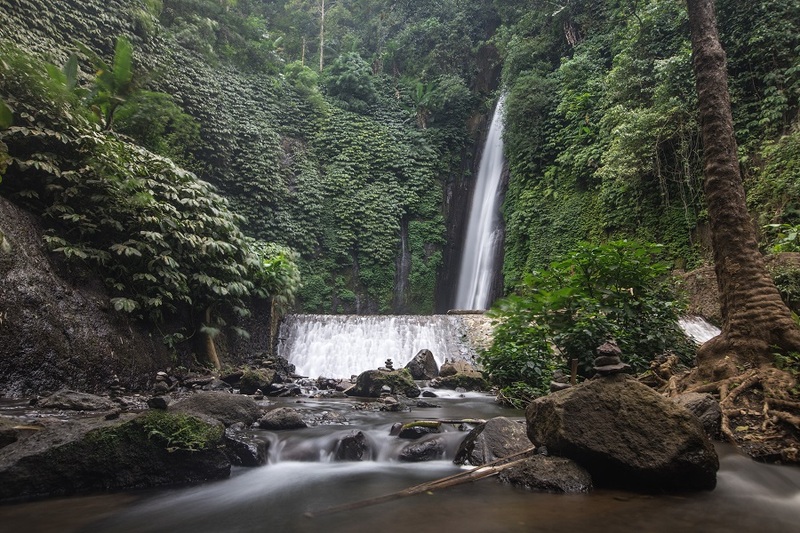 I think Tegenungan is the busiest and most visited waterfall in Bali (not really sure, but we will go with it). It is built up for tourism, with a ton of restaurants and shops at the top parking area. There is a nice viewpoint of the waterfall before all the steps. It is a long way down, but good concrete steps lead to a smaller waterfall, or “natural massage,” and to the massive Tegenungan. There are several spots for great pictures on each side of the waterfall. There is a swing you can pay to take pictures on, and a trail leads up to the top of the falls. Just below the top of the falls is my favorite spot, where you can get close to the waterfall with pictures of the dropping cliffs. If you want to enjoy this waterfall “almost” to yourself, make sure to get here no later than 7 AM. Large crowds start arriving by 8 AM. 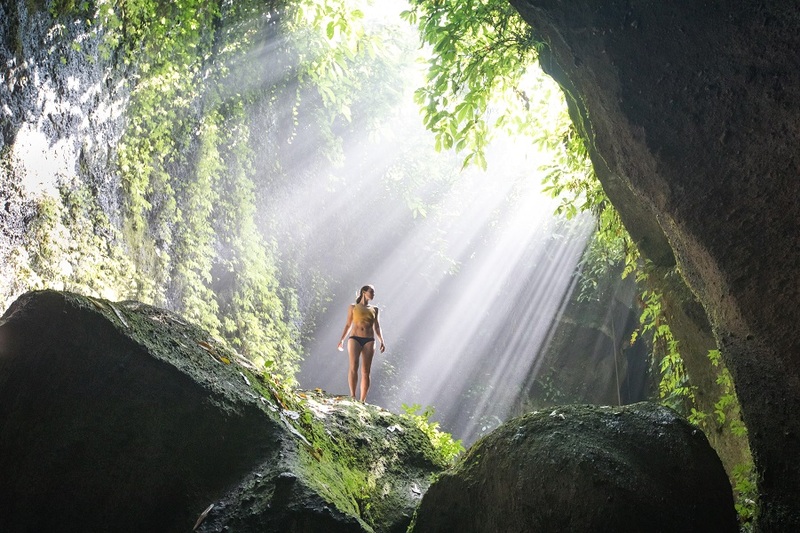 Located just south of Ubud, it is a 20 to 30-minute drive. Banymala was an adventure to get to, but it was ohh so worth it. The gentle flowing waterfall is beautiful. 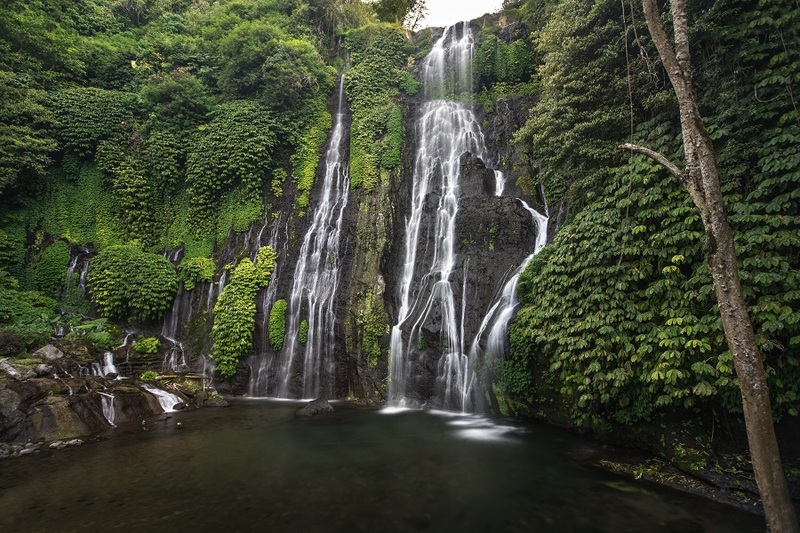 This is one of the best waterfalls for swimming in Bali as there is not a strong current and a large deep pool underneath the falls. Getting here is a journey. The last few kilometers of road is pretty bad. There is a parking area “at the top” where most people walk from here. It is possible to continue driving a scooter to the ticket booth if you are a very confident driver, but I would encourage everyone to park at the top and walk down. It is a 15-minute walk on a steep sandy path with two small rivers to cross over. From the ticket booth, it is a 5-minute walk down to the waterfall. Located north of Lake Buyan, Banyumala is a one and half hour drive from Ubud. It looks just as good from above! 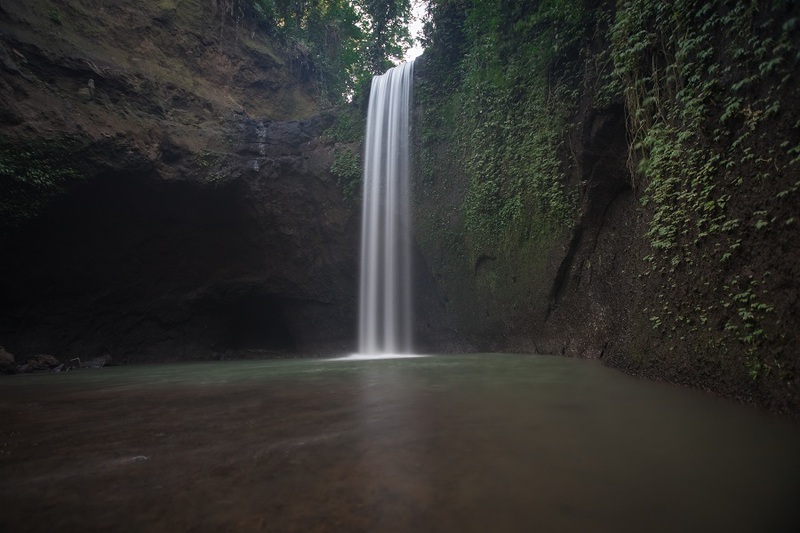 One of my favorite waterfalls in Bali and the most “playful” would definitely be Kanto Lampo. This waterfall does not get as crowded as nearby Tegenungan because you have to walk through waist-deep water to get the best shots. 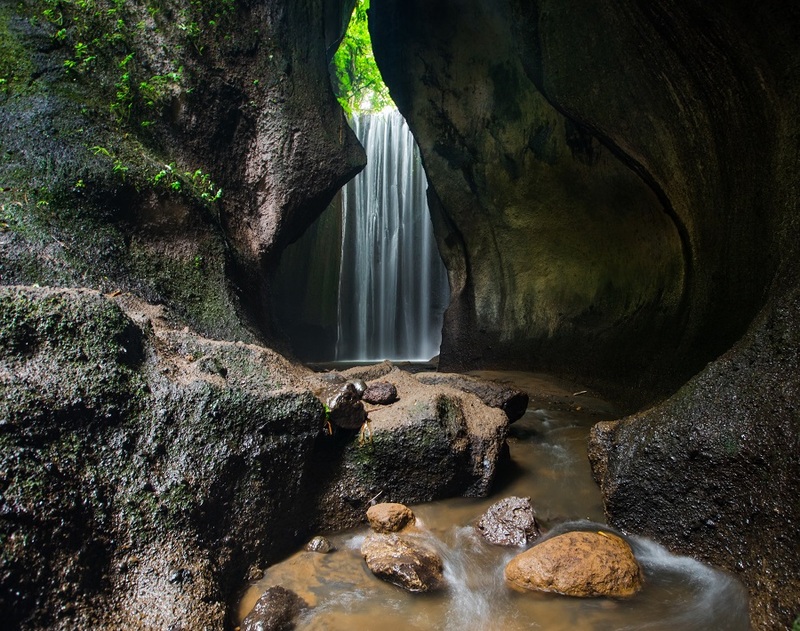 You can climb up on the rocks in several spots and with a very dark setting, this is the sexiest of all waterfalls in Bali. 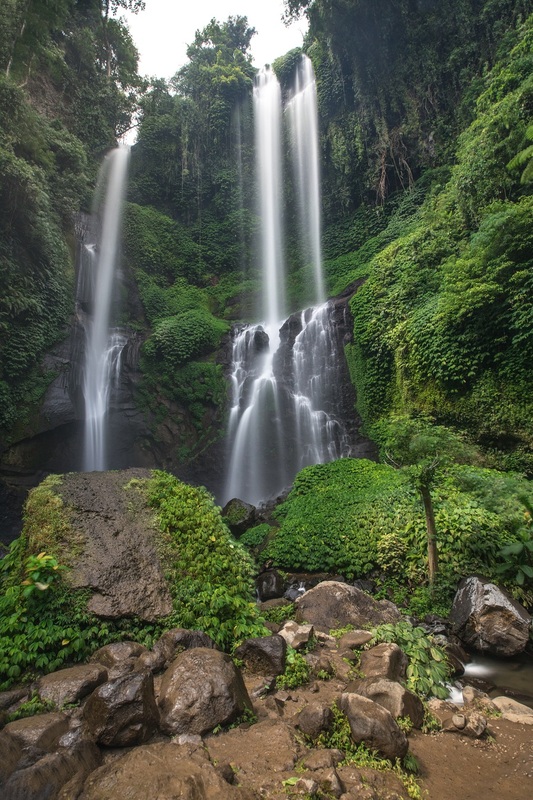 Located 40 minutes east of Ubud, Kanto Lampo is close to Tibumana and Tegenungan Waterfalls. 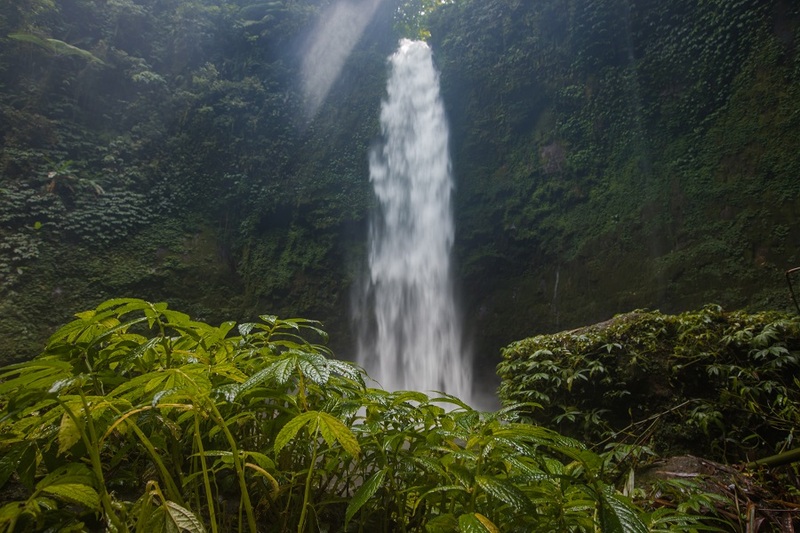 Sekumpul is the tallest waterfall in Bali and one of the most popular. Waterfall tours to the north are usually highlighted with a stop here. There are a few viewpoints of the waterfalls on the long way down, and then there are several great places to get creative with pictures. The waterfall is strong, so there is a lot of mist in certain spots which can make it difficult for photos. I spent a lot more time here than other waterfalls waiting for the right lighting and fewer crowds. It is best to come early in the morning for the best lighting. The drive here is on a narrow winding road down a mountain from Bedugal. Watch out for all the scammers with signs all over the area that say waterfall parking and registration. Make sure to go to the official parking (the last one). Located in north Bali, Sekumpul is in the small village of Bebetin, 2 hours from Ubud. Entry Cost: 5K for parking, 20K for waterfall entry. 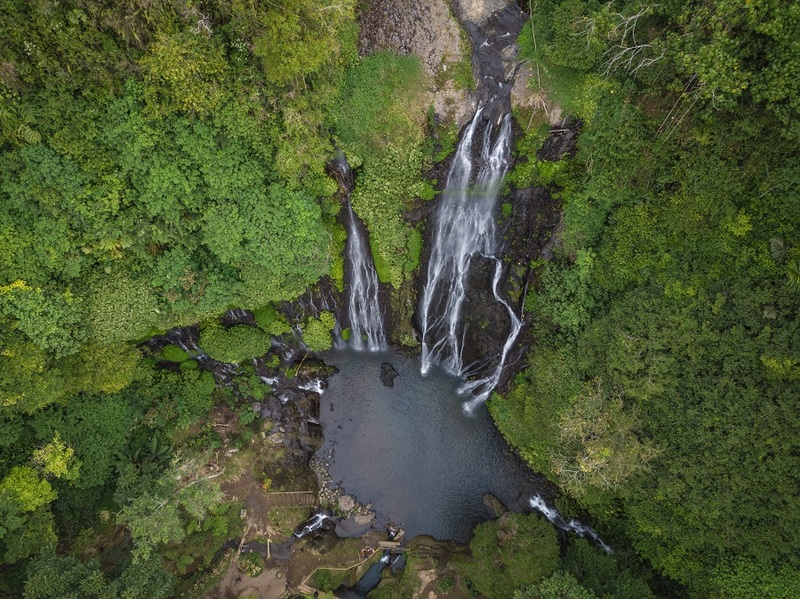 Additional 15K for nearby Fiji Waterfall. Tukad Cepung is my favorite waterfall in Bali. 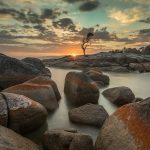 It is by far the most unusual and has two different spots to take amazing photos. 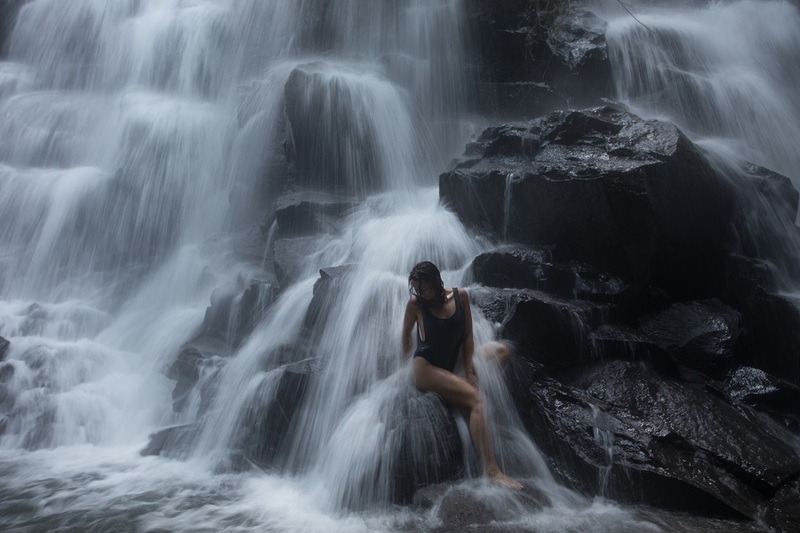 It used to be a “secret waterfall,” but Instagram has definitely added to the hype and it is getting much busier than in the past. Before arriving at the waterfall, there are a few large boulders which are a great spot for pictures. The waterfall is essentially inside a cave. 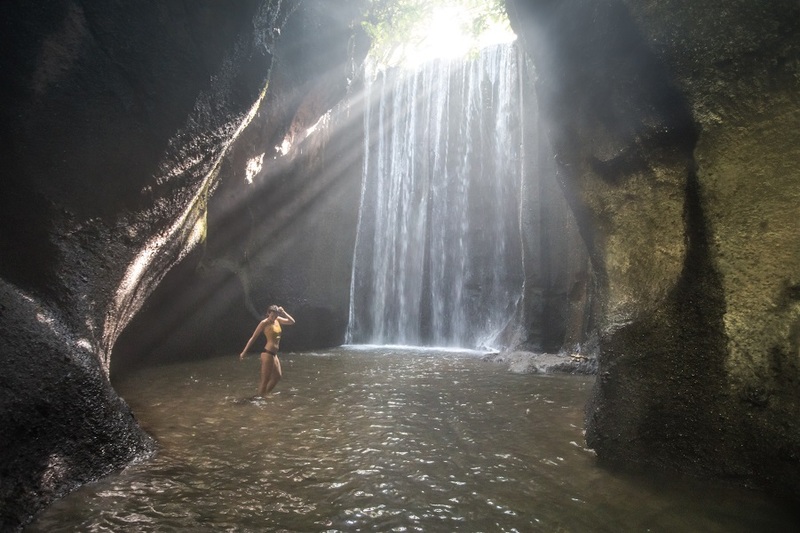 For those lucky to visit on a sunny day, you can get the most amazing sun rays inside the gorge, making this waterfall look like it is straight out of a fairy tale. There are a few stairs leading down into a narrow slot canyon where a stream is located. You have to walk through the stream in a couple of spots, and the waterfall is at the end of the gorge. Located in central Bali, Tukad Cepung is 1-hour east of Ubud. The best way to get around Bali is to rent your own scooter and explore on your own. With that being said, driving in Bali is special. The traffic is hectic and learning to safely overtake cars can be a struggle. Every fourth tourist in Ubud has some sort of bandage on their arms and legs from a scooter accident, and hopefully not a bad one. My best advice is to follow how the Balinese drive and take cues from them. If you aren’t interested in renting a scooter the best way to get around is to hire a private driver. Renting a scooter for 1 day in Ubud is 50k – 60k. Hiring a driver and car in Ubud is between 500k to 600k for a 10-hour day including petrol. 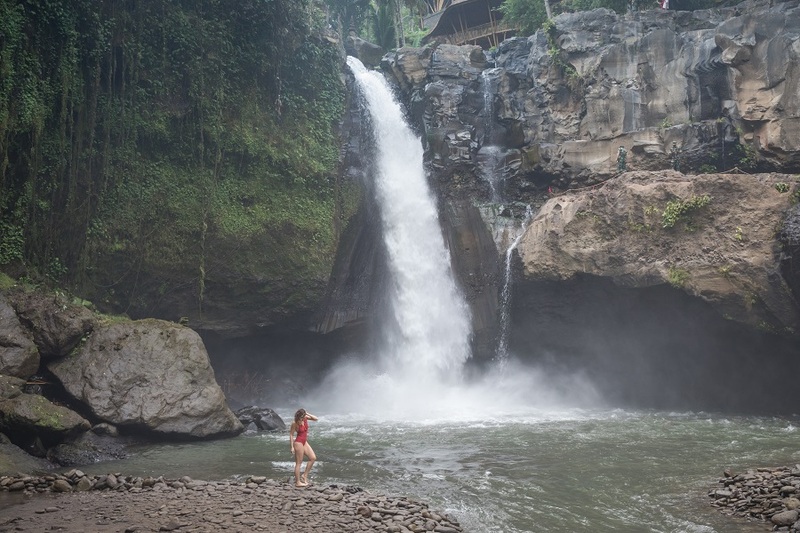 Starting from Ubud, leave early (6:30 AM early) to Tegenungan waterfall before the crowds arrive. From there head to Tibumana for some great photo ops. 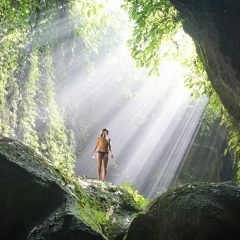 Then head to Tukad Cepung in time to catch the rays descending into the cave. 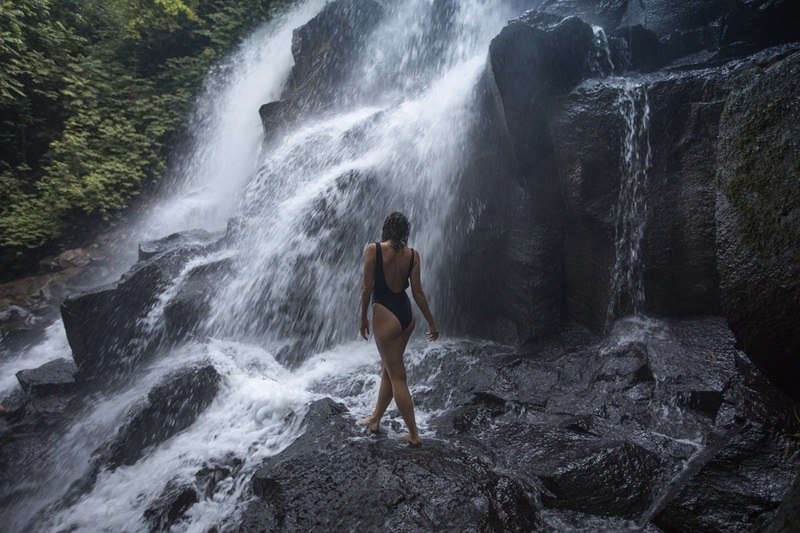 One the way back to Ubud, cool off with the swim at Kanto Lampo waterfall. 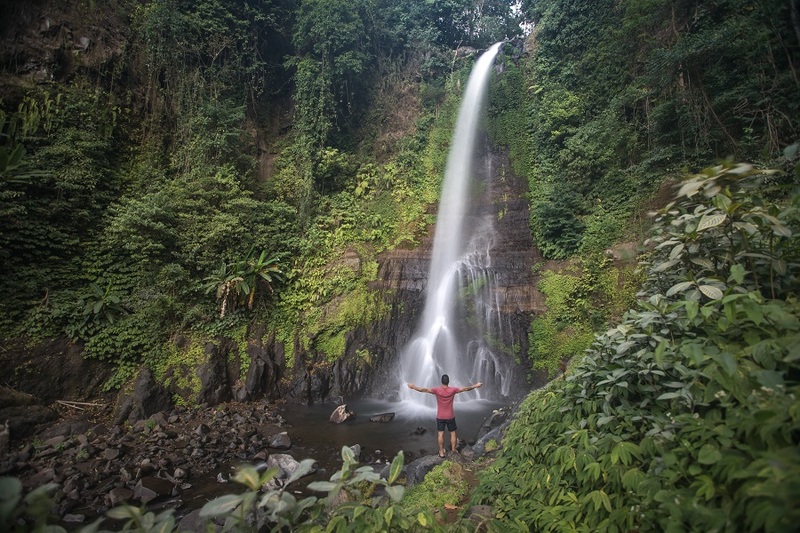 From Ubud (or wherever you are staying), head to Nungnung waterfall for the first stop. From there drive to Sekumpul waterfall, one of Bali’s prettiest waterfalls. Then decide what sort of adventure you want. 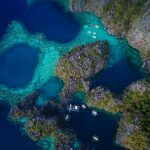 If you’re into cliff jumping head to Aling Aling Waterfalls for an adventure tour. 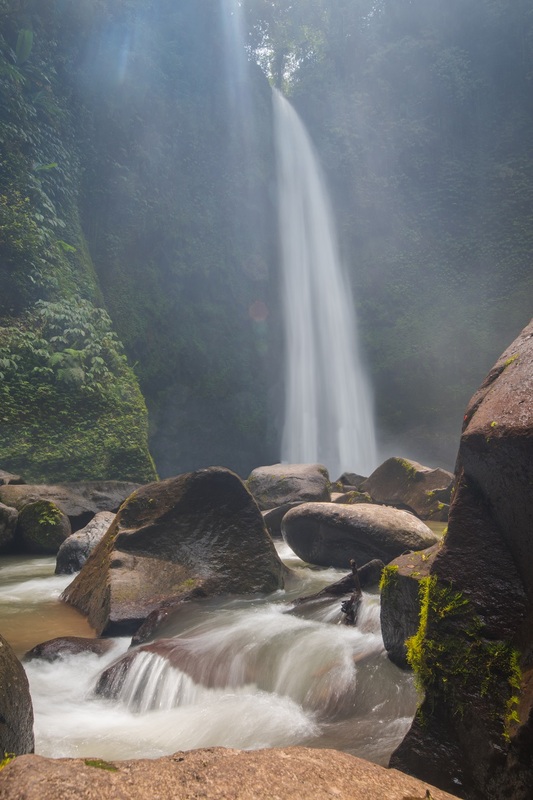 If not, explore Gitgit Waterfall and Banyumala Twin Falls. 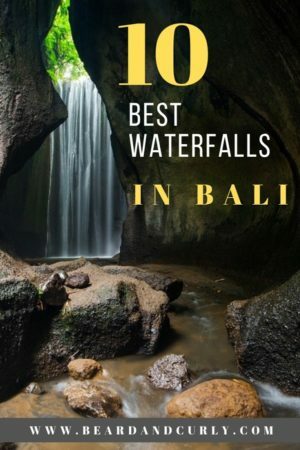 Did I miss any of your favorite Bali waterfalls? Let me know in the comments section! Ahh we love Bali! You should come…so many waterfalls, beautiful temples, great food, and nice beaches too! I just got to Bali so this post will definitely be useful for my stay here! Loving the pictures, they all look simply stunning, thanks for sharing! Perfect timing Odette! Let us know if you have any questions about other things to do! Wow. the Banyumala Twin Falls are amazing. And all the rest, too. Agree, Banyumala is a beautiful waterfall. It is perfect for swimming, and in the late afternoon, there were only a couple other people there! I LOVE WATERFALLS, so this post was right up my alley. Like I legitimately want to see every single one of these now! Perfect, and you should!! There are even more than these 10 that are beautiful, it was hard to pick our favorites. This is so great! Now I’m sitting here with waterfall regret! I’ve been to the Tegenungan but thats it. You guys look like you had a great time. I will definitely pin this for future Bali expeditions. This makes me want to grab a ticket to Bali immediately! So gorgeous! Thank you for sharing this fabulous list. I will definitely save it for future reference! Wow Bali has such stunning waterfalls. Thank you for such a comprehensive list. Literally makes me want to be there right now!!! I love that you included the time it takes to get there!